Record Skype call can be done in many ways and with many software programs. However, to record Skype call made with AV Voice Changer Software, it is the best that you use AV Audio & Sound Recorder program. More info: this program belongs to a powerful pack of multimedia software program from Audio4fun called Media Player Morpher, yet believe or not, it is 100% FREE. So feel free to download and install it before we go over the very easy-to-get-done steps below. This tutorial is only applicable for all editions of AV Voice Changer Software including new 8.0 DIAMOND edition. ** This step should be done in case you would want to have your voice changed during the call by Voice Changer Software. If you do not want that, leave it alone. 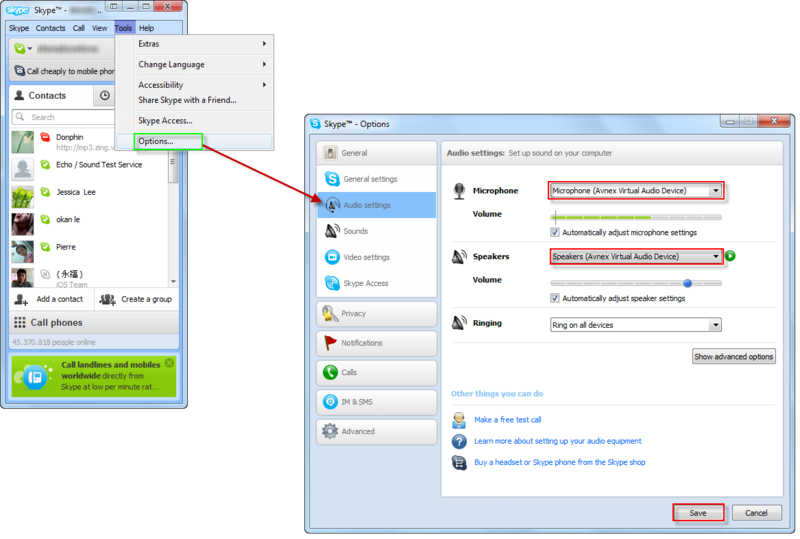 If you get confusing on this, read the tutorial on how to change voice during Skype call. Select Speakers (Avnex Virtual Audio Device) as default device for Speakers. Hit Save button to apply the settings. Run AV Audio & Sound Recoder and add Microphone (Avnex Virtual Audio Device) as one of the sources to record from. The AV Audio & Sound Recorder and Media Morpher tools are truly good programs and should be in help a lot in recording and editing audio. Its features are to much for me to cover in this post, so feel free to try it and feel it yourself. However, if you have any questions, just leave your comment here and we will try to help out.